Classic Engineering consults with architects, contractors, and owners on the engineering needs of their building projects. Specializing in Structural, HVAC, Plumbing and Electrical Engineering. Please view our project portfolio to see the broad nature of our work. Watch for the release of a new website in the near future. Give us a call at 616-742-2810. Classic Engineering provided HVAC & Plumbing engineering services on this project. Classic Engineering assisted Dan Vos Construction with structural engineering services to relocate an existing exterior column and create a new overhead door opening. Classic Engineering provided Structual, Plumbing & HVAC engineering services on this church renovation project. 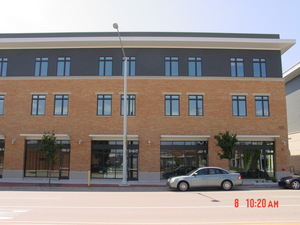 The two buildings consist of 32 loft, one-bedroom and two-bedroom apartments with retail space facing Wealthy Street. Each apartment has a gas fired furnace for individual control. The central high efficiency water heaters have a digital recirculation system. The buildings are owned and operated by the Inner City Christian Federation. The facility showroom is heated and cooled with a 15-ton gas fired roof top unit, using exposed spiral ductwork and low wall return. Classic Engineering provided the structural engineering on this unique private structure. 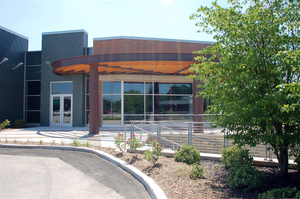 Classic Engineering provided mechanical and plumbing engineering for this 15,000 square foot addition, more than doubling the size of the existing facility. 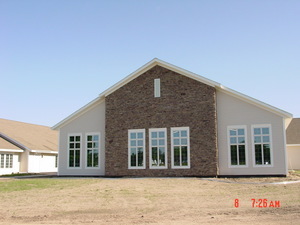 The new addition provides classrooms, warming kitchen and a fellowship hall for the church. The mechanical system uses grade mounted roof top units with under ground ductwork for higher ceilings thru-out the building. Classic Engineering provided structural engineering services as part of this GM Image Enhancement project. Work included new overhead doors and entry into the service write up area and the new monument sign at the front of the showroom. A renovation project being driven by GM’s image program, Classic Engineering will assist Triangle Associates in providing the design-build services for Urka which is located in Ludington, Michigan. 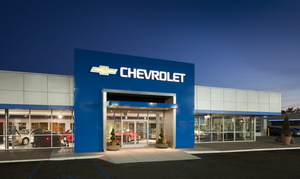 The Fox Quick Lane renovation consisted of retrofitting a commercial retail building into an automotive service facility. 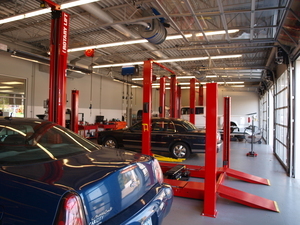 The project involved installation of a vehicle service area, office and a customer waiting area. The entire facility received new flooring as well as mechanical, electrical and plumbing upgrades. A portion of the east wall of the structure was removed and reconstructed to facilitate the new overhead doors in the services area. 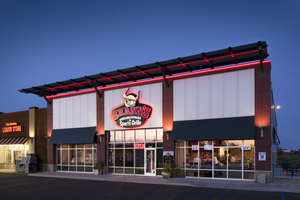 This project involved a retrofit of a Big Boy location into a new Brann’s Sports Grille according to owner specifications. Classic assisted with the design of the new entry and expanded seating area. Also designed the structure for a future addition. 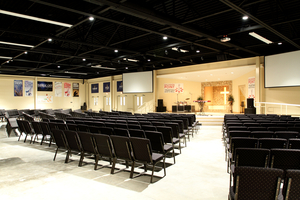 Classic Engineering performed the structural design on this rural church facility as part of the design/build team. 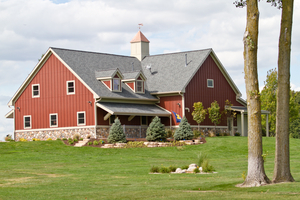 This project was an addition to an original Dan Vos Construction project, which includeded indoor baseball and softball diamonds, five batting cages and a basketball court. The most recent 20,609 sq. ft. addition includes two regulation size tennis courts, equipped with lighting catered specifically for the courts; four batting cages; and two soft toss areas. Classic Engineering worked with Pleune Service Company to design the HVAC system for the additional space. Classic Engineering provided the Structural, Mechanical and Electrical Engineering servcies on the new 22,000 sf retail building at Breton Village Mall, anchored by Anthropologie, a high-end retail women’s clothing and home decor store. Potential restaurant and additional retail space available. The desigin included Multi-facade block, brick, glass and metals. Unique canopies and curves with ample glass accent the building. 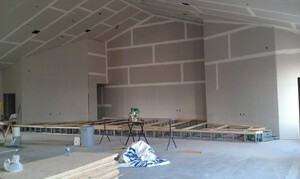 This recently remodeled church was, at one time, strictly warehouse space. To complete this project, 12,842 sq. ft. was renovated into Chapel space while 12,805 sq. ft. was renovated into education space. In order to complete the new chapel and education space, DVCC completely removed the roof structure, inset steel columns and steel roof trusses within the existing warehouse walls. Various features of the space include polished, concrete floors throughout the chapel space, an exposed metal roof deck complete with K-13 acoustical material in the chapel, six inch rigid poly roof insulation and a new fire wall to separate different groups’ usage. Classic Engineering provided the Structural and HVAC Engineering on the project. Classic Engineering assisted Triangle Associates in the renovation upgrade of the Kool Chevrolet dealership as part of the new General Motors image enhancement program. 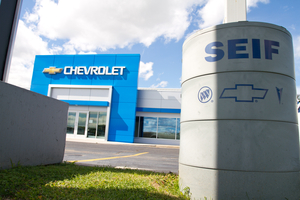 Newly renovated areas include showroom areas, service department, parts and body shop. 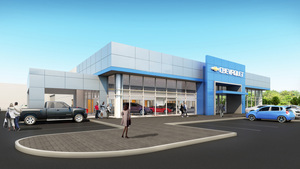 The exterior elevation has also been updated according to the General Motors' Design Intent Document (DID) compliance. Classic Engineering provided mechanical, electrical and plumbing for this multi-housing facility.